The helmet debate continues for riders, especially of my generation. It flares up when well-known competitors or local friends get injured. After the incident passes the debate continues at a quiet level. I will be honest: I am late to the helmet wearing side of this debate. Before, I would wear them for some events or on some horses, but not consistently as I do now. Lots of us do it that way- judge some situations as helmet-worthy. Obvious times are on young horses or while jumping. We think youth should wear them, but we hesitate to set the example. Maybe we think helmets make us look afraid or geeky. Ironically, buying trainers insurance decided the debate for me. I read in black and white in the policy that I was responsible for the safety of others. It got personal- I thought about how I would feel if one of my horses hurt someone, and it grew from there. All situations became helmet worthy from that vantage point. It followed that I should set the example with concern for my own hard head. And eventually, I got to be proud of my choice to make no exceptions to the helmet rule at my barn. I got here a bit backward, but now I never ride a step without a helmet. Don’t misunderstand, I am a giant fan of personal choice. I don’t like having laws to tell me how to dress. I just wish wearing a helmet was everyone’s personal choice. Dodger and Hilda, Classical Dressage Enthusiasts. Sometimes I wonder if making the helmet decision on a case by case basis isn’t more dangerous than not wearing one at all. When I see my peers wearing hats for photo opportunities I wonder if that is the part-time helmet message they mean to send others. Special occasions should be the time we wear helmets especially. My youngest student is proud to be wearing a helmet with her half chaps and boots. It is part of the badge of honor to be a rider. Everything about adults is more complicated. I do know this for sure; horses are addictive, complex creatures and risk is part of the package. Ride forward, do your best, and please take very good care of what makes you who you are. Don’t hesitate to let your Geek flag fly! One day 20+ years ago I made that ‘helmet or no helmet’ call on the ‘no’ side because I was only going out for a hack. I was surprised to find myself on the ground in the pasture with my horse racing around loose and had no memory of even driving out to the barn. After a visit to the emergency room where my concussion was diagnosed, I have never again gotten on a horse without a helmet. It would feel like driving in a car without a seatbelt – I just can’t do it. I’m so glad to see so many trainers now wearing helmets – for themselves as well as for the people who will follow their example. The data coming out of the NFL studies on head injuries shows how little we really know about the cumulative effect of them. We can’t control much in life, but this is one thing we can do to keep ourselves a little healthier and safer. Well said, Anna, and great picture too! Helmet covers are so handy for attaching costume accessories! Helmets are a must. I also bike ride and use a bike helmet. I have/had no issue using a helmet. Two years ago, I had a pretty bad “fall from horse” as the emergency room folks put it. I remember nothing except part the the ambulance ride. Even though I spent 4 days in the hospital, I was still feeling pretty chipper about the whole event. Then I saw my helmet. Oh boy!!! Now I gently (or not so gently) encourage all to use one while riding. As a friend said it is not if it is when – you will come off. I heard you all talking blogs the other day and glad that I found yours! It is stories like these that help us raise awareness on helmet use. 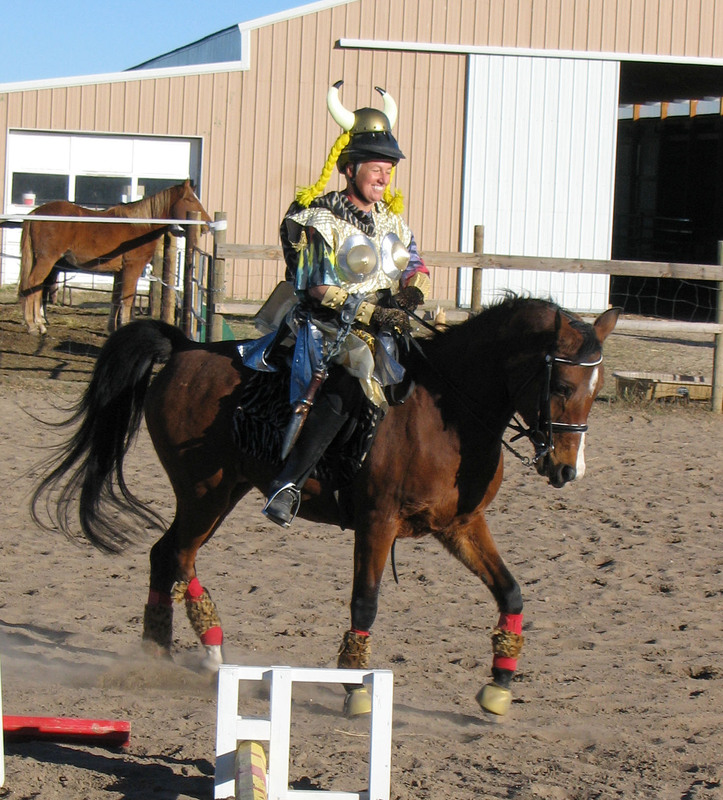 A $39 Troxel helmet – so I am convinced – saved my life during an accident in 2008. I fell head first, helmet did split a little and I did have some bleeding on the brain, which subsided by the next day, thank God. Yes, the helmet made me look like a ‘bubble head’, but I looooved it for it’s character, not for its looks ;-). This article includes measuring instructions for purchasing a helmet. Thanks, glad you are still around, too.